I wonder where she is. . . .
Or where they all are. 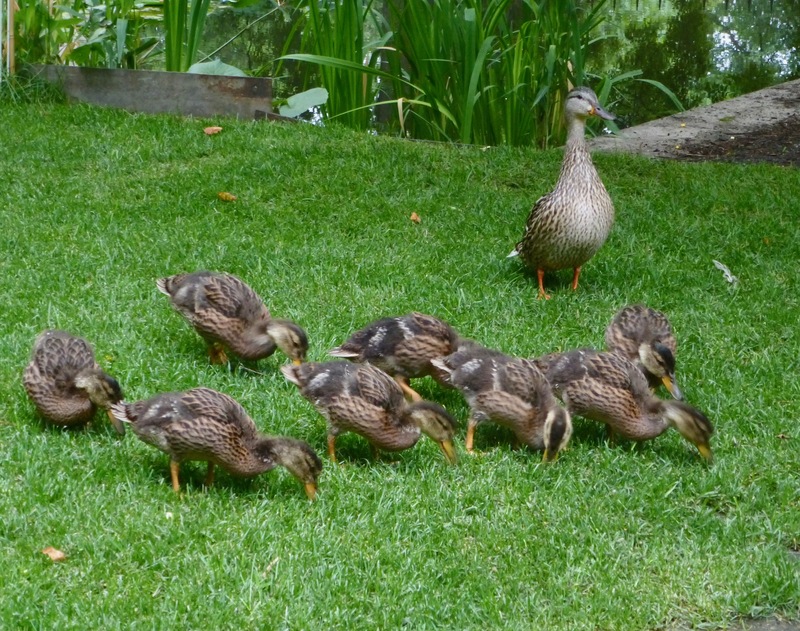 Here’s the crop of this year’s ducklings, photographed when they were awkward teenagers. Honey was a great mother. Now it’s snowed in Chicago, and the pond is vacant. I hope that wherever she is, she’s warm and has lots of food. I’d take bets on whether she’ll be back in the Spring, but I have no idea. . . This entry was written by whyevolutionistrue and posted on November 16, 2018 at 2:30 pm and filed under ducks. Bookmark the permalink. Follow any comments here with the RSS feed for this post. Both comments and trackbacks are currently closed. Must count on something these days so I am counting on her return and on another fine brood. Hopefully Honey is warmer than we are here in Eastern Ontario. We are getting a huge dump of snow right now. Ulgh. Looking forward to Honey’s return and a long season of PCC updates on a brood of healthy ducklings. I’ve done the math, completed the analysis, used Bayesian methods, flipped a coin, checked the tea leaves. Chances are they’ll be back. Are the turtles gone too? They’re hibernating in the mud. I bet she’ll be back. Do you remember ducks at Botany pond before you became a duckophile? Maybe Honey has been there in years past and you didn’t notice, and if so, more of a chance that she’ll be back. I believe she will be back because I can’t bear to think otherwise. I suspect she was coming before Jerry noticed her too, and she’s going to keep coming back to a place where she feels relatively safe and especially has a reliable food source. Also, because of Jerry she was able to fledge eight ducklings this year. I don’t know whether they remember stuff like that, but if they do, she will associate that success with Botany too. You’re a great godfather, Jerry. We have wild ducks who fly into the zoo every year to hatch chicks. (There’s lots of food to steal and it’s safe there.) Whether or not it’s the same pairings or if it’s the chicks returning to their first home, we don’t know. But, I’m counting on Honey’s successful return. We’ll see…. Let’s see. Unlimited free food, plentiful mates, duck islands, safe place to raise nine offspring…What’s not to like? She’ll be back. If I were her, I’d return. Where else could I find such nice food? Why not get them ringed next year? You could become a proper ornithologist & join a local bird group!